Central Community Services, Inc. exists to develop resources and programs that engage our organization in effective educational, artistic, and community development endeavors in the Midway community of St. Paul. Tuesday & Thursday 3 p.m.–5:30 p.m.
Free Arts programs provide youth in challenging circumstances a safe place for expression and self-discovery. With the support of caring adult volunteers and partner sites, we work alongside youth while engaging in art projects. Providing these safe, supportive and consistent experiences enables participants to build trusting and positive relationships that have a life-changing impact. HAP is a non-profit organization focused on empowering the refugee and immigrant community by moving our clients out of poverty and towards social and financial prosperity. The Hubbs Center provides educational services to adults who want to improve their basic skills, earn a GED, prepare for employment or post-secondary education, or learn English. ELL Classroom assistant: Monday–Thursday (choose one day a week): 8:30 a.m.–1:30 p.m., 9:30 a.m.–11:30 a.m., 11:30 a.m.–1:30 p.m., 11:30 a.m.–2:30 p.m., 1:30 p.m.–4 p.m., 4 p.m.–5 p.m., 5 p.m.–8 p.m. Math Classroom assistant: Monday–Thursday 9:30 a.m.–11:30 a.m., 11:30 a.m.–1:30 p.m.; Monday and Wednesday 5 p.m.–8 p.m.
Computer basics classroom assistant: Monday/Wednesday 9:30 a.m.–11:30 a.m.; Tuesday/Thursday 11:30 a.m.–1:30 p.m.; Monday–Thursday 1:30 p.m.–2:30 p.m or 4 p.m.–5 p.m.
Additional times can be arranged with the site coordinator. Irreducible Grace Foundation works with youth, especially youth of color and youth who are aging out of foster care or state guardianship, to become highly successful adults. We assist youth to develop or repair emotional trust in adults while planning and achieving their college, career, and life goals. St. Peter Claver is a school that fosters academic excellence in all areas of study, encourages discipline based on respect and responsibility, and develops a sense of service and social justice. Through Public Achievement, people of all ages work with others to meet challenges and solve problems. They learn from each other the meaning of citizenship and democracy. Ordinary people do extraordinary things. 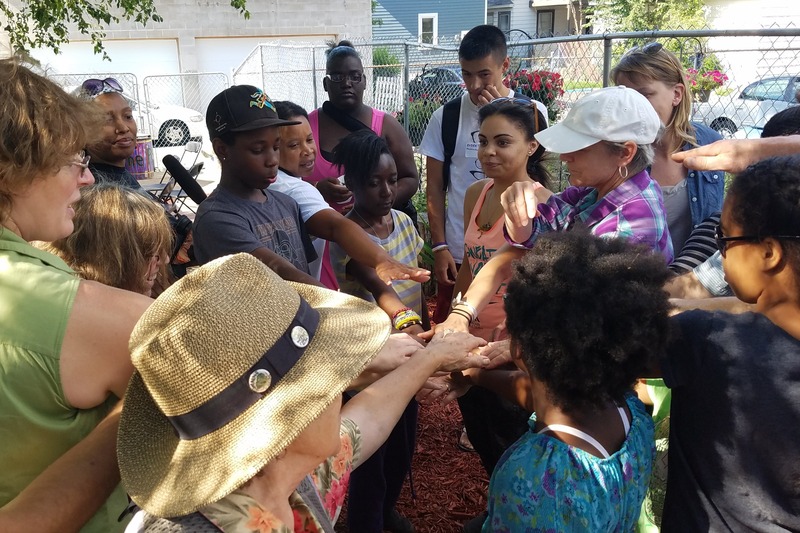 Wednesday 10:30 a.m.–noon or 1 p.m.–2:30 p.m.
We connect people in Saint Paul with the imperative and the joy of learning through a lifetime. We are a cornerstone of a thriving city: welcoming people of all ages and cultures; strengthening neighborhoods and learning networks, and inspiring all with the world of ideas. The Twin Cities Mobile Markey is a grocery store on wheels that brings affordable, healthy food directly to under-resourced neighborhoods. We believe everyone deserves access to healthy food. Wednesday 10:30 a.m.–1 p.m., Thursday 2 p.m.–3 p.m., Thursday 3:30 p.m.–4:30 p.m., Thurs 5-6 p.m., Friday Noon–1.p.m., Friday 1:30 p.m.–2:30 p.m., Friday 3:30 p.m.–4:30 p.m.